Click here for the "H&V" Speed Rated version of this tire in more sizes. Click here for the "W&V" Speed Rated version of this tire in more sizes. Average wear. Discoloration on side walls. Very good all purpose tire. Great value for all season radials. Vulcan's prices made the value even better. Best of all these tires were made in the USA!!! I certainly would buy Mastercraft tires again for both my cars and truck. I would also buy from Vulcan again. Much quieter than previous tires. Very pleased with these tires. best buy! MADE IN THE U.S.A! Bought a full set of mastercraft Avenger Touring LSR tires for our AWD Subaru Forester becuase of the durability rating and low prices. Have driven about a 1000 miles so far. The ride, handling, and traction have been excellent, even in about 5 inches of snow. There is a slight tire noise at speeds above 40mph. Am very happy with tires. 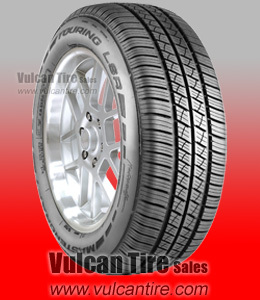 VulcanTire shipped them extremely quick and cheap!! Great tire - bought it because it is made in USA - good price and value. Like so much I am buying 2 more.